August, 2018. 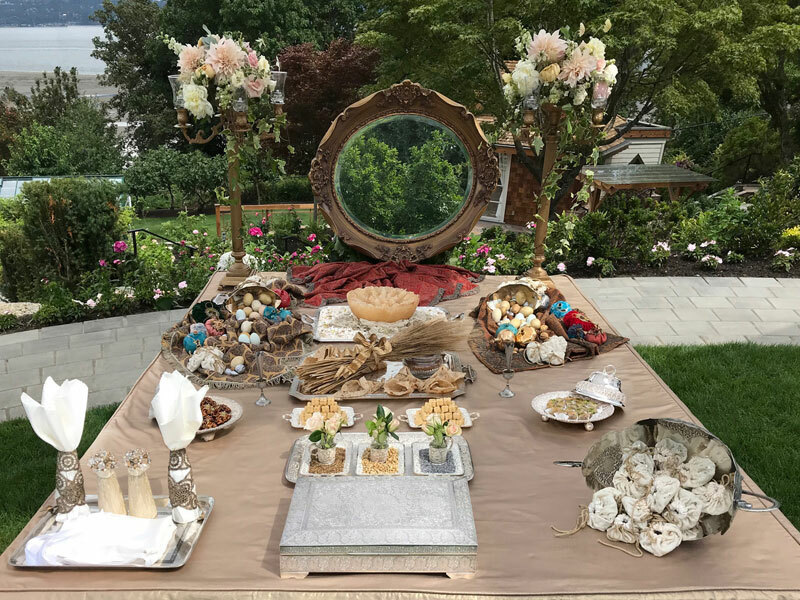 This delightful outdoor sofreh was put together by the author in Vancouver, B.C., Canada, for the marriage ceremony of a friend. In August 2018 this refreshing outdoor sofreh was put together by the author in Vancouver, Canada. This image presents the overall composition, incorporating many of the symbolic elements of the marriage sofreh (sofreh-ye aqd). The next images show the intricate details of this sofreh. This is the central part of the sofreh. Three small trays, known as farmanbar, contain natural pods of rue (esfand), as well as its gold and silver decorated seeds. 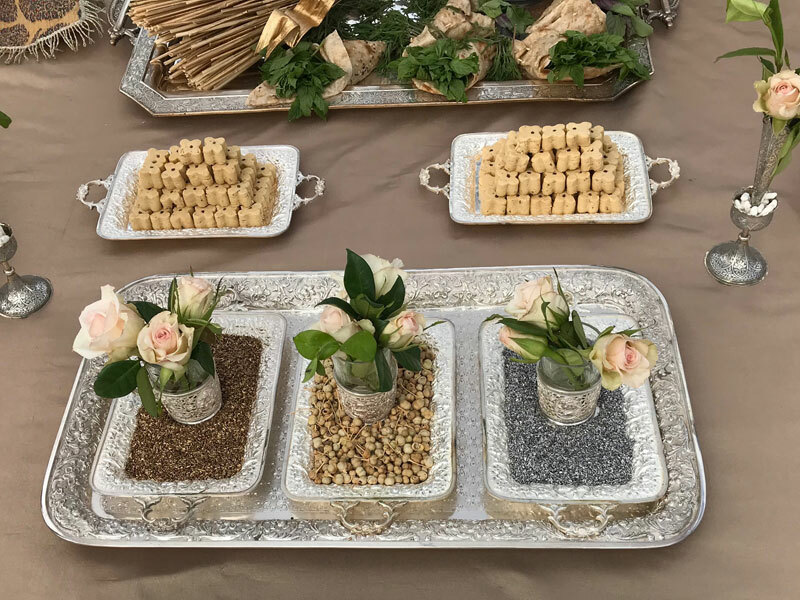 A traditional Persian tea glass containing miniature roses and foliage is placed in the centre of each tray. 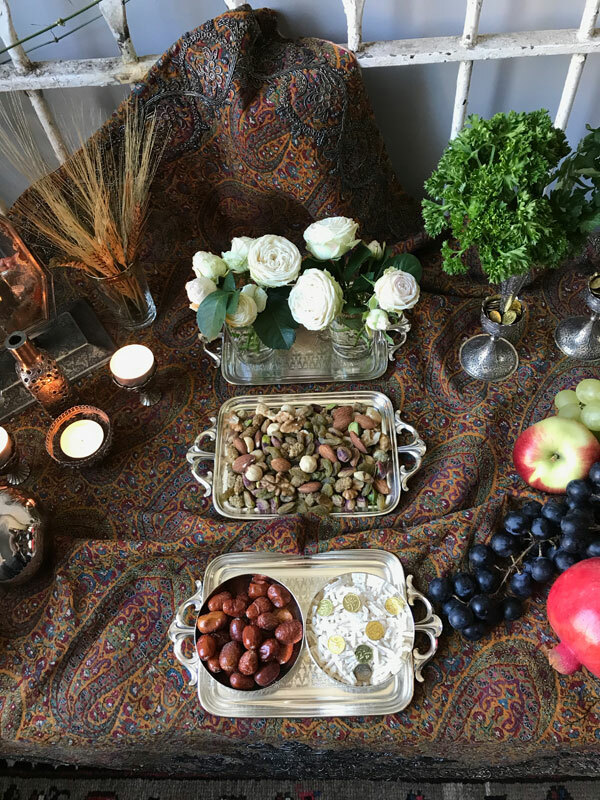 Behind this delicate composition, there are two farmanbars containing traditional Persian home-made pastries. 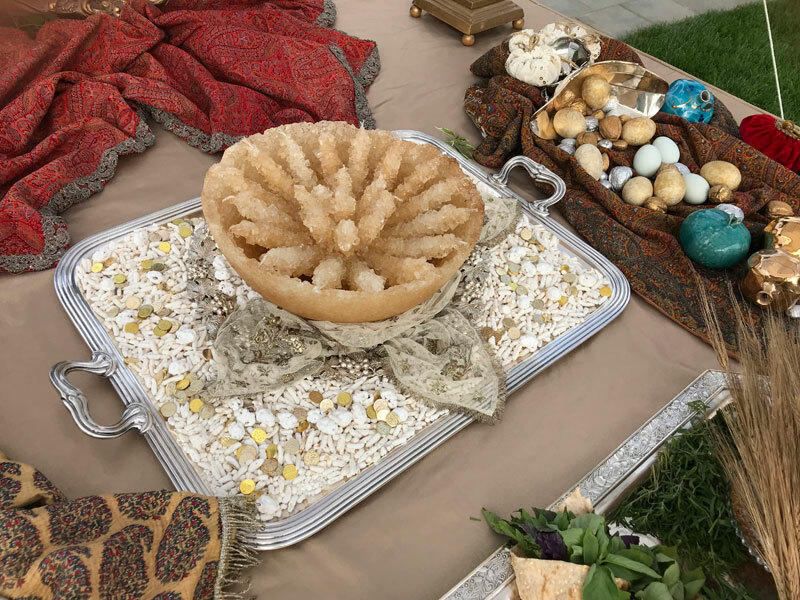 This delightful bowl of crystal sugar, known as kaseh nabat, forms part of the August 2018 outdoor sofreh. 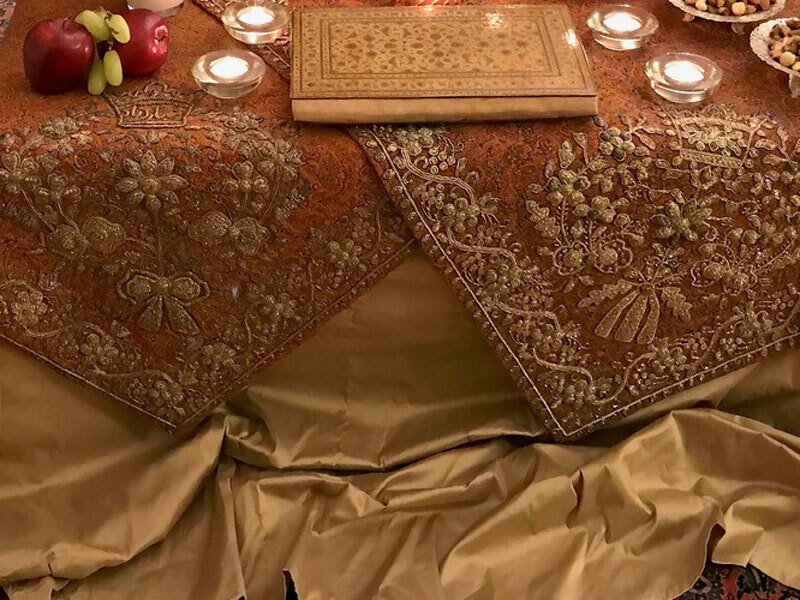 The kaseh nabat is placed on a round silver tray and embellished with a piece of antique embroidered tulle, known as naqdeh. 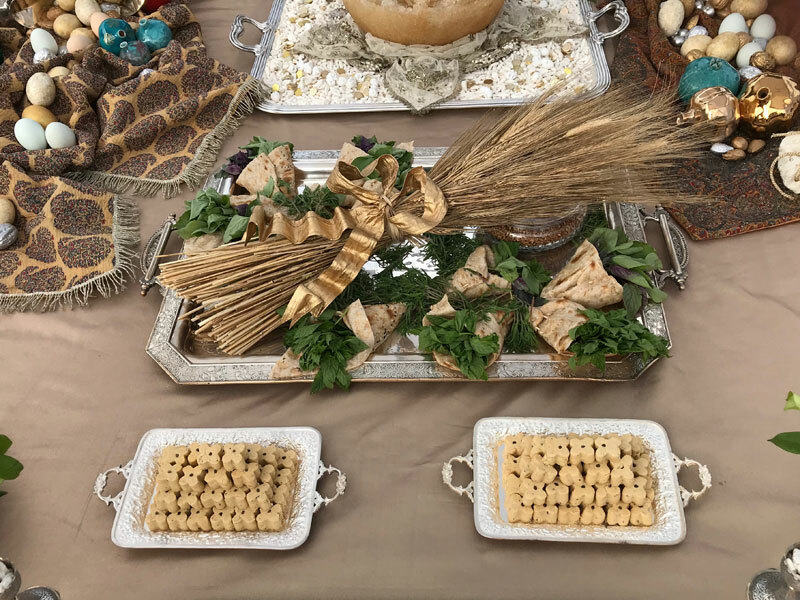 The round tray is presented on a bed of Persian sugared almonds and gilded coins, known as noql and sekkeh, on a larger silver tray. This is another section from the August 2018 outdoor sofreh showcasing a bunch of wheat and flat bread in the shape of a cone holding fresh herbs—all symbols of growth, abundance and flourishing. In the foreground two farmanbars contain traditional Persian home-made pastries. This section of the August 2018 outdoor sofreh includes a piece of antique Persian textile, known as termeh, beautifully embroidered with metallic thread. 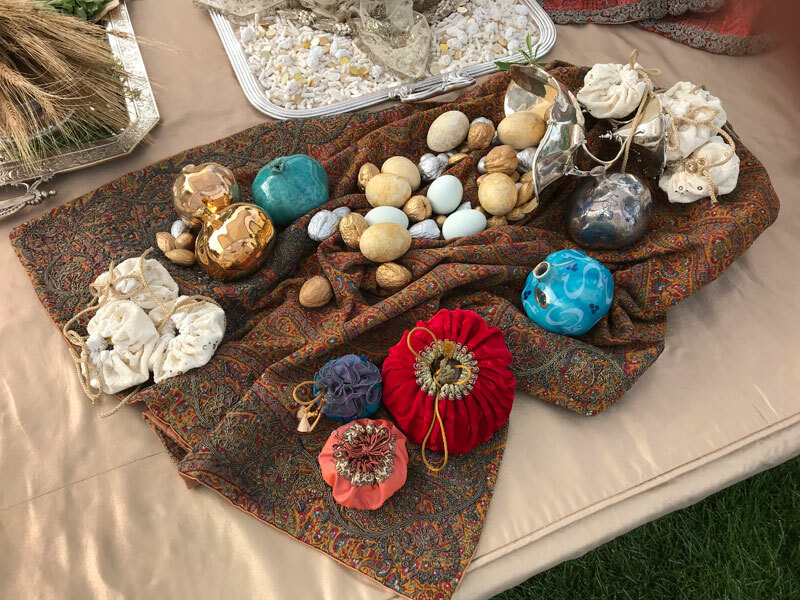 A mixture of natural and hand-decorated eggs, nuts, ceramic pomegranates and hand-made bonbonnières flow out of a tilted, antique silver container. This corner of the August 2018 outdoor sofreh includes a different piece of termeh, with a lovely metallic fringe. 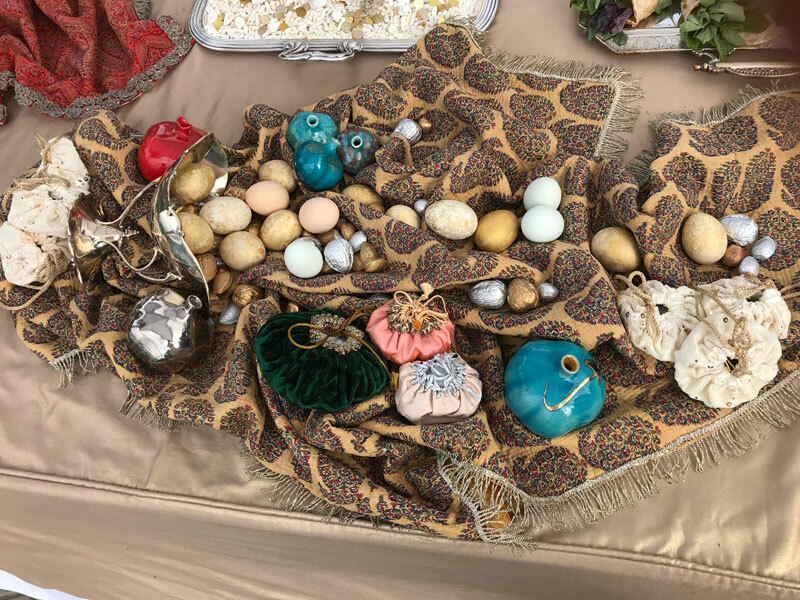 Once again, a mixture of natural and hand-decorated eggs, nuts, ceramic pomegranates and hand-made bonbonnières flow out of a tilted, antique silver container. October, 2018. 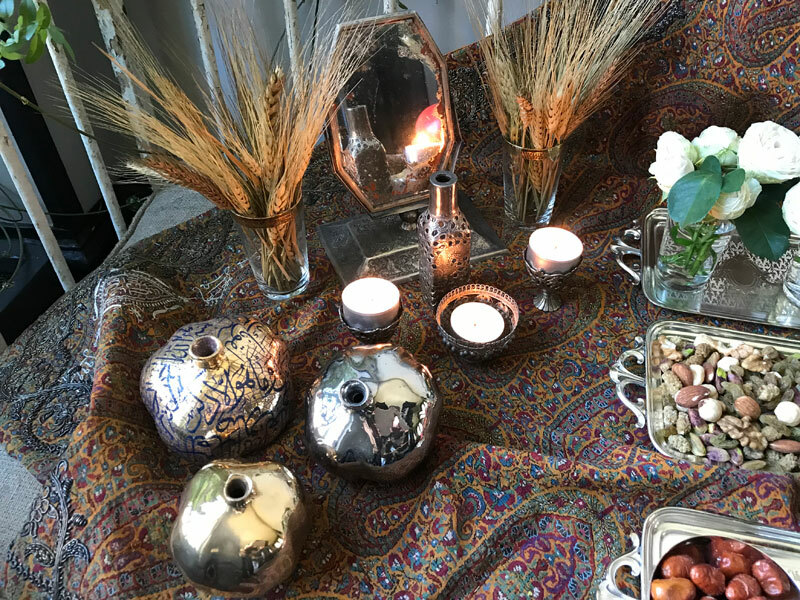 In the Persian culture, Jashn-e Mehregan is believed to have the same significance as the celebrations of the New Year (Nowruz), with Nowruz signalling the beginning of spring and Mehregan marking the beginning of autumn. 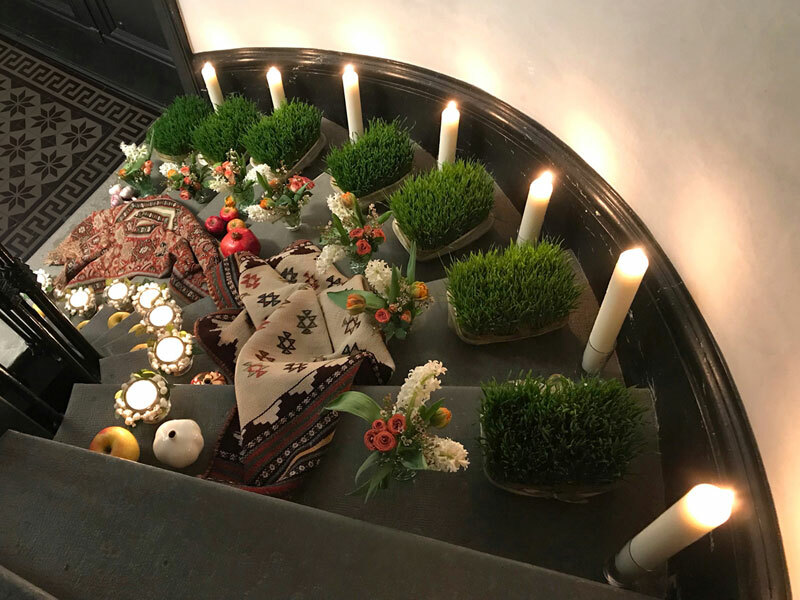 The celebrations, which have their origins in the pre-Islamic period and are associated with agriculture and harvest, start on 16 and end on 21 Mehr in the Persian calendar, which correspond to 8 and 13 October, respectively. 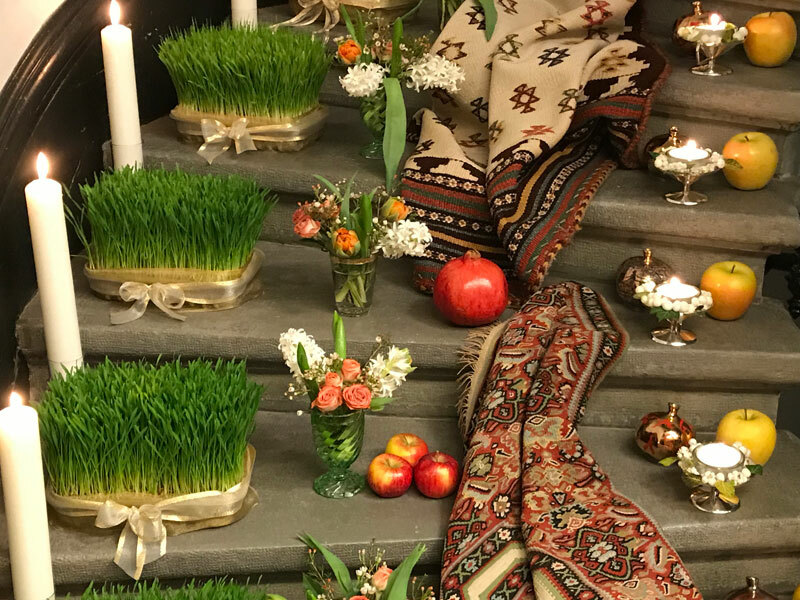 The Mehregan customs have evolved over the years, and while there are celebrations, people do not spread a sofreh. However, a sofreh was apparently part of the celebrations in the past. December, 2018. Shab-e Yalda, or the winter solstice, is the longest night of the year. It is the eve of 1 Dey in the Persian calendar, corresponding to 21 December. 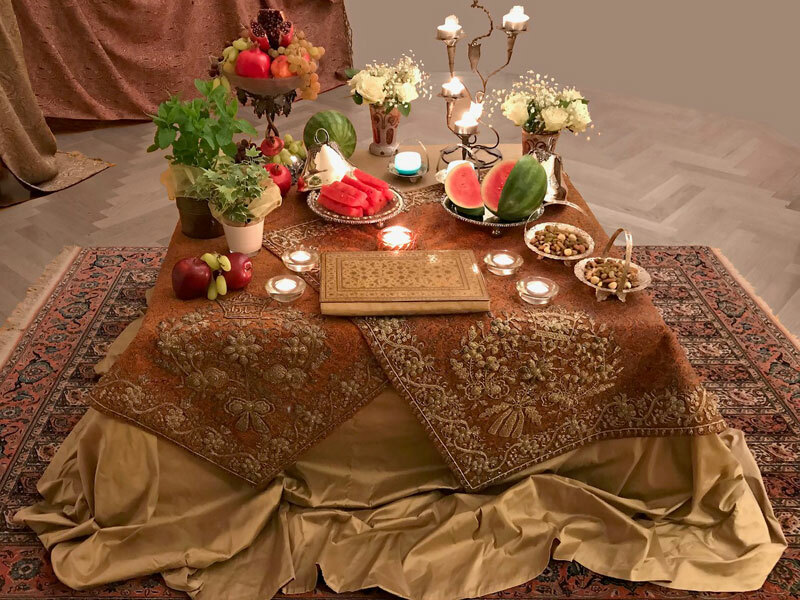 The feast of Yalda originates in the pre-Islamic period and is associated with agriculture. 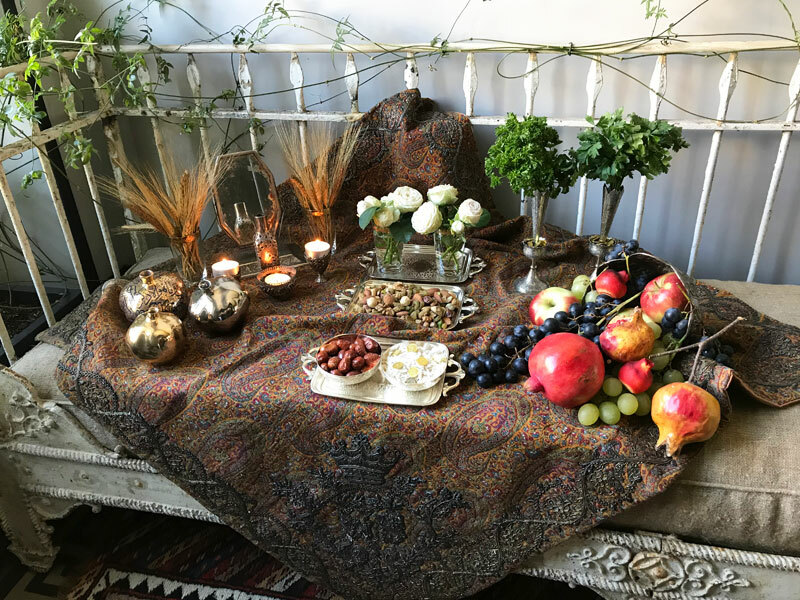 In the Persian culture people get together, fruits and nuts are served, and stories and poetry are recited to get through the darkest and the longest night of the year, when it is believed that demons are most active. 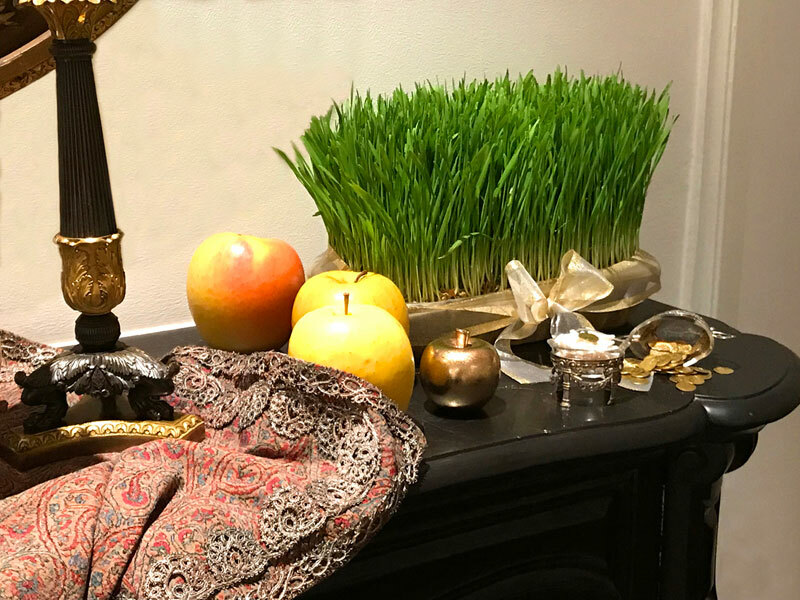 This is a contemporary sofreh for the occasion of Yalda, incorporating two exquisitely embroidered Persian textiles, known as termeh, fruits, flowers, herbs, nuts, a beautifully bound book of verse, and lots of glowing flames. Red fruits—watermelons and pomegranates—are important components of this celebration, heralding the crimson hues of sunrise after absolute darkness, and the promise of longer days ahead. This section of the sofreh for Shab-e Yalda focuses on the details of the exquisitely embroidered termehs, with flowers, tendrils, bows, tassels, crowns and “congratulations” written in Persian script. 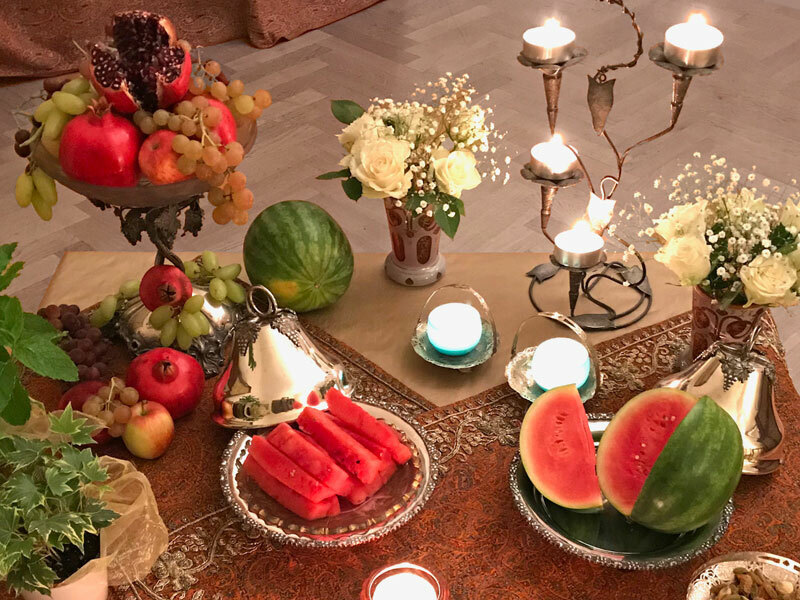 This is the heart of the sofreh for Shab-e Yalda, which focuses on the red fruits—whole and open pomegranates, as well as cut and whole watermelons. Red fruits are important components of this celebration, heralding the crimson hues of sunrise after absolute darkness, and the promise of longer days ahead. 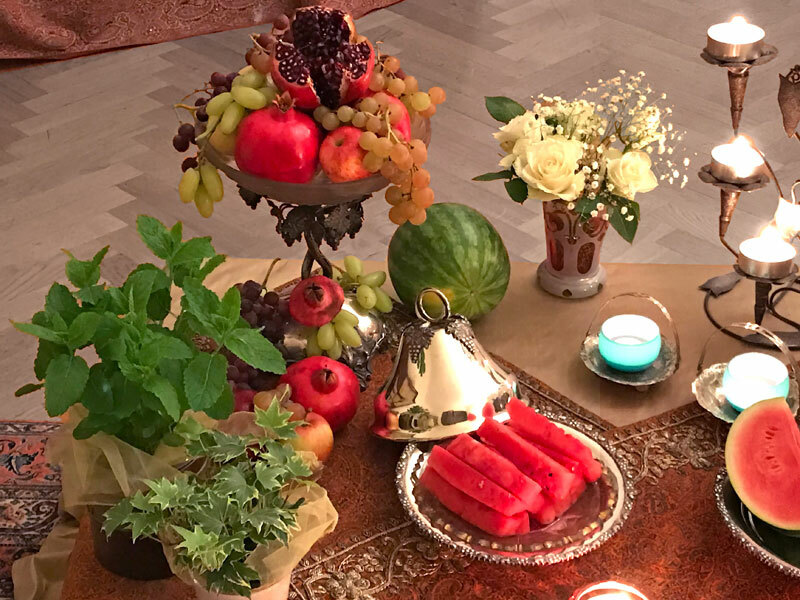 The main focus of this corner of the sofreh for Shab-e Yalda is a selection of fruits (especially red fruits), fresh herbs and foliage. December, 2018. 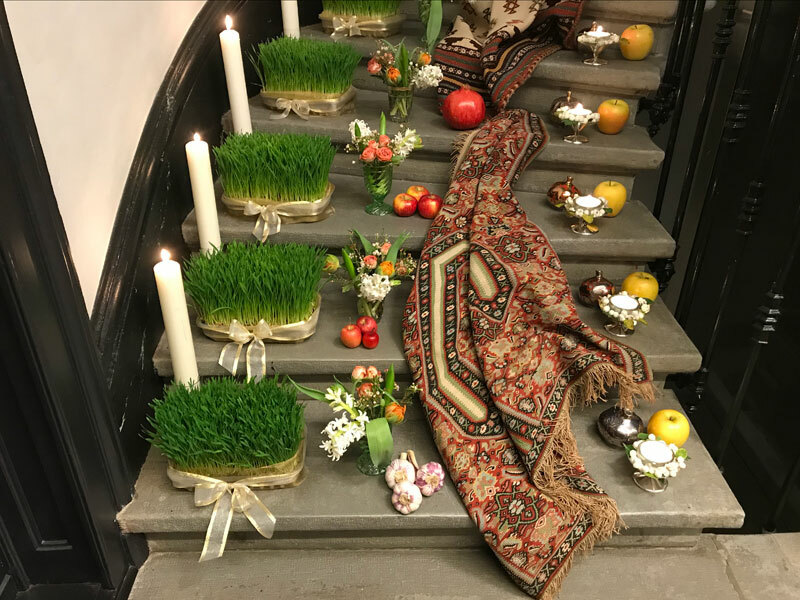 This unconventional and original outdoor sofreh is inspired by the symbolic elements of sofreh-ye Nowruz (haft sinn) such as germinated wheat (sabzeh), spring flowers (hyacinths and tulips), apples and pomegranates, as well as Christmas ornaments such as pine cones, nuts, and holly and pine sprigs. The first two images present the overall composition in two different lights — before and after sunset — which demonstrate a fascinating contrast. This appealing image was taken before sunset. The sofreh is displayed on four levels — the surface of a round, metal table covered with artificial snow, two garden chairs, an acrylic side table and the floor itself. The shiny ceramic pomegranates are reminiscent of baubles. 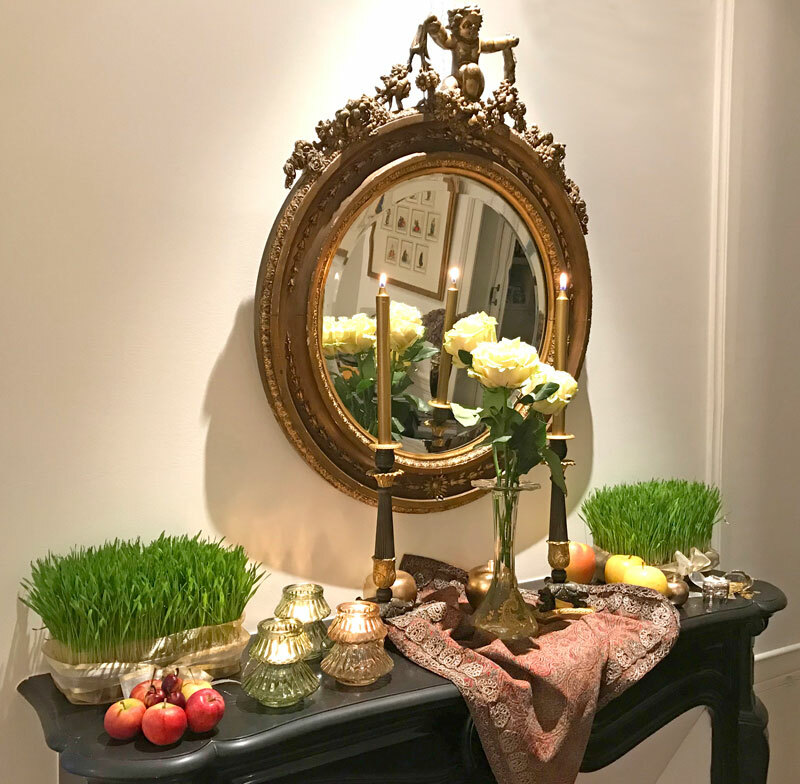 The most dazzling characteristic of this unusual sofreh is the numerous shimmering candles, which are part of both Nowruz and Christmas adornments. This image, which also reveals the engaging backdrop, was taken after sunset. The sofreh is displayed on four levels—the surface of a round, metal table covered with artificial snow, two garden chairs, an acrylic side table and the floor itself. The shiny ceramic pomegranates are reminiscent of baubles. 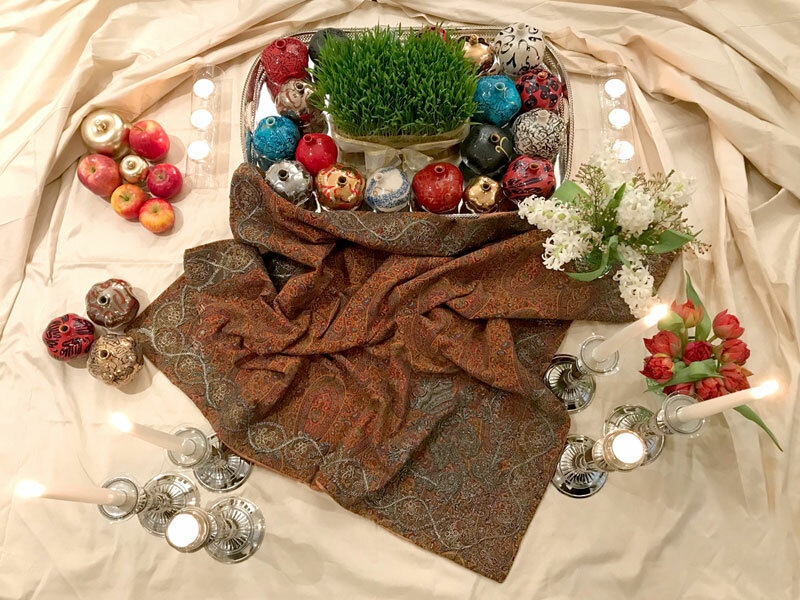 The most dazzling characteristic of this unusual sofreh is the numerous shimmering candles, which are part of both Nowruz and Christmas adornments. 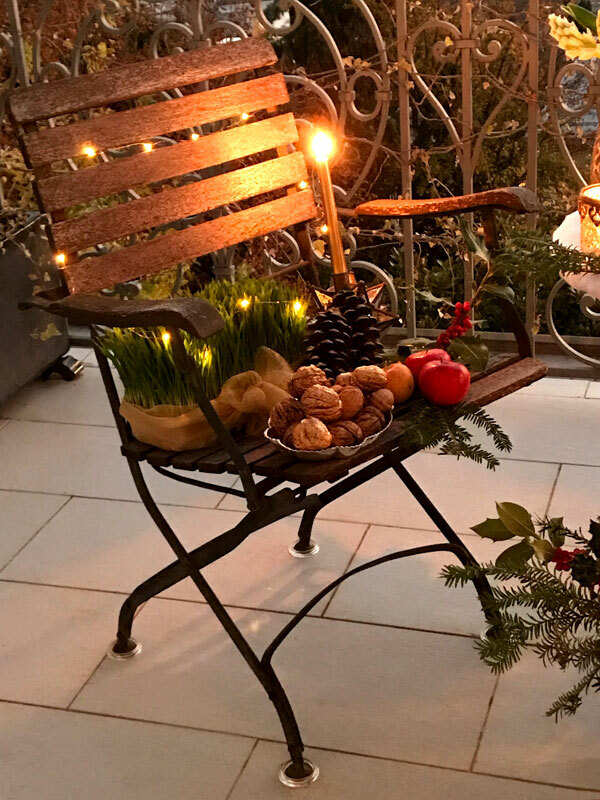 This image focuses on one of the garden chairs featuring fresh sabzeh illuminated by Christmas tree lights, holly and pine sprigs, oversized walnuts, apples, pine cones and a mirrored candle-holder supporting a single shimmering candle on the chair. 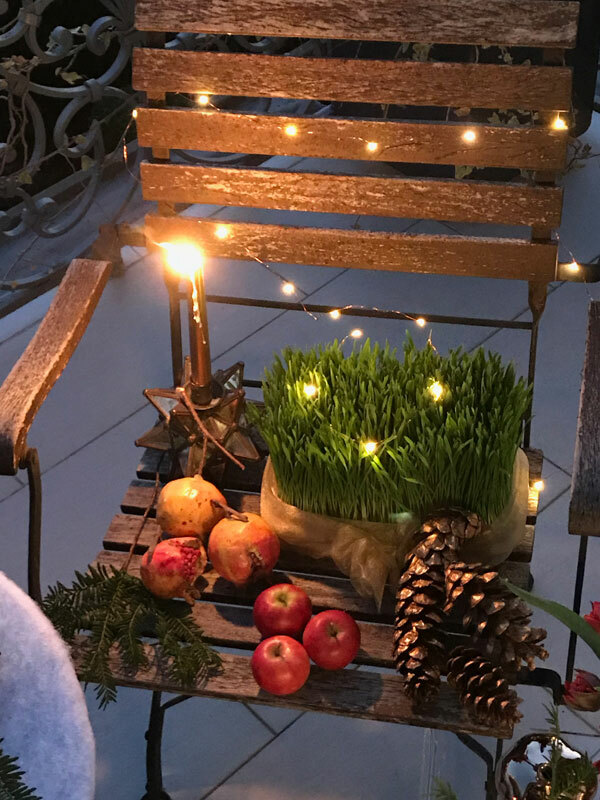 This image focuses on the other garden chair featuring fresh sabzeh illuminated by Christmas tree lights, pine sprigs, pomegranates, apples, pine cones and a mirrored candle-holder supporting a single shimmering candle on the chair. The focus of this image is the acrylic side table, providing an unusual base for the ceramic pomegranates in various shades, which are enchanting alternatives to baubles. 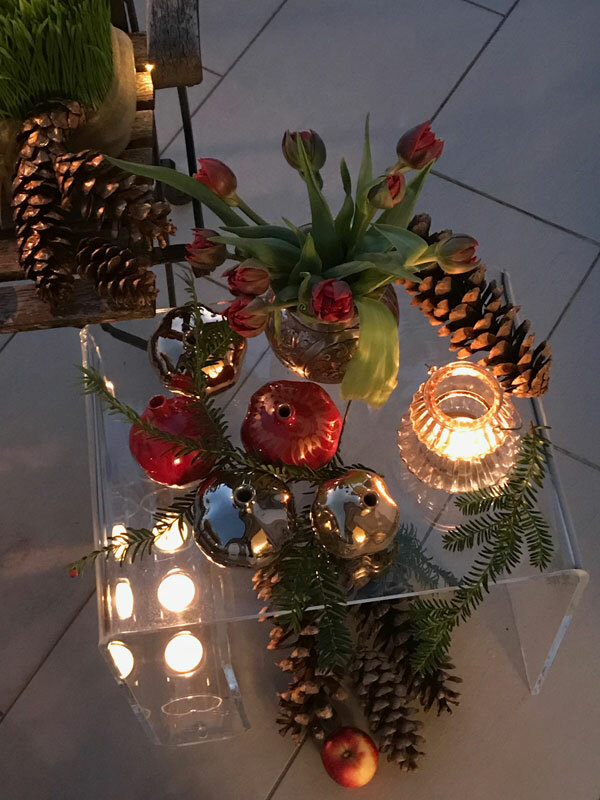 The rough and natural pine cone on the table, as well as similar pine cones and a single tiny apple underneath the table provide an interesting contrast with the glossy pomegranates. A bouquet of red tulips brings a touch of spring. The composition is illuminated by a row of shimmering tea lights placed in the “pocket” of the table, and a separate tea light in an elegant holder. 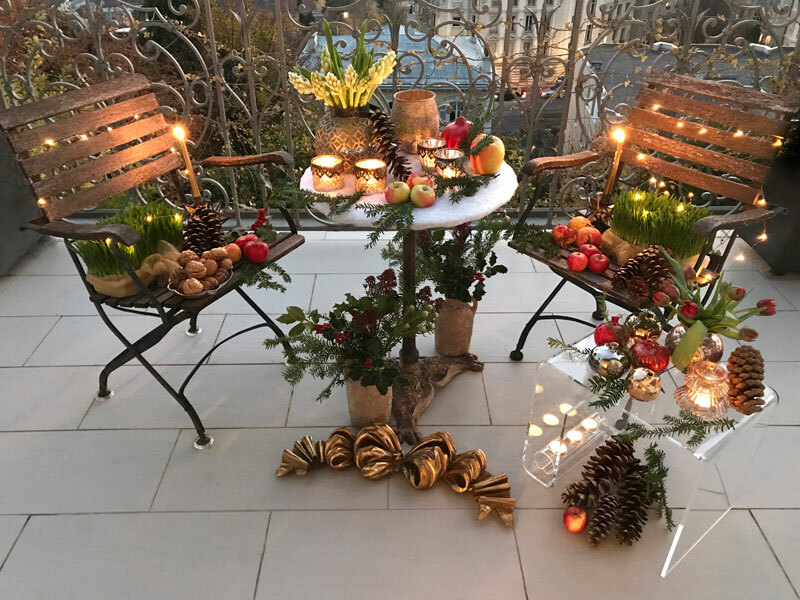 The focus of this image is the central table covered with artificial snow, presenting the juxtaposition of the symbolic elements of Nowruz (hyacinths, a jumbo crimson pomegranate, an oversized apple, as well as tiny apples) with Christmas ornaments (pine tree sprigs and a giant pine cone), all subtly illuminated by candles placed in elegant holders. January, 2019. 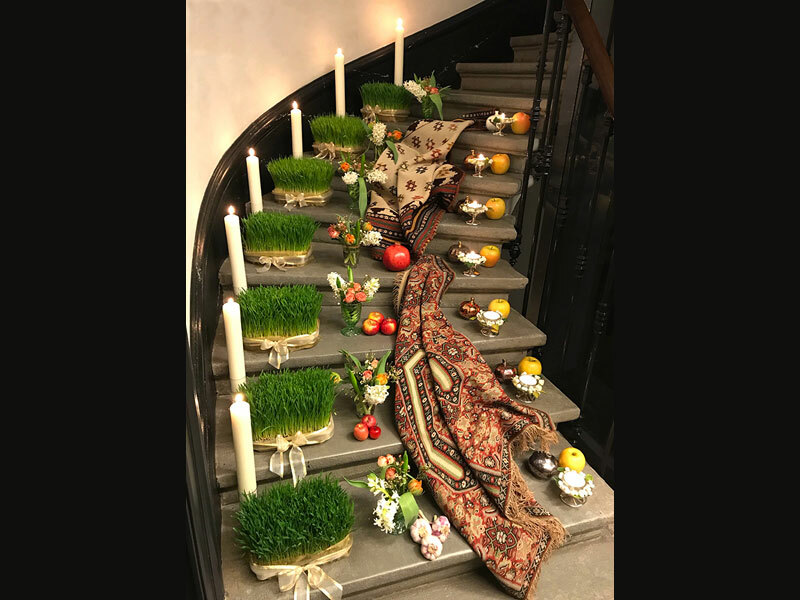 This is an unconventional sofreh, entitled “Seven Steps”, installed on seven levels, incorporating some symbolic elements of Nowruz, and highlighting the number seven. 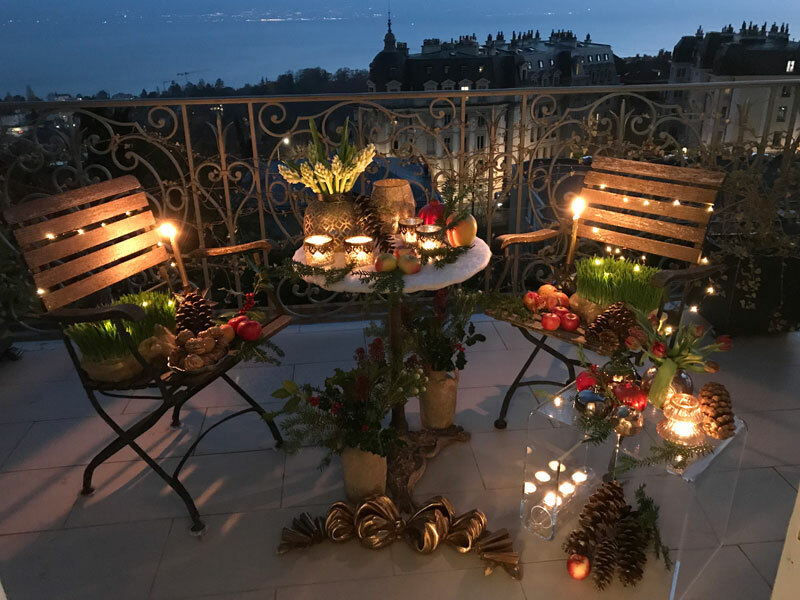 Seven rectangular sabzehs and seven glowing pillar candles are neatly placed on the wider side of the staircase, while seven oversized Delblush apples, seven silver containers of shimmering tea lights and seven ceramic pomegranates decorate the narrower side. 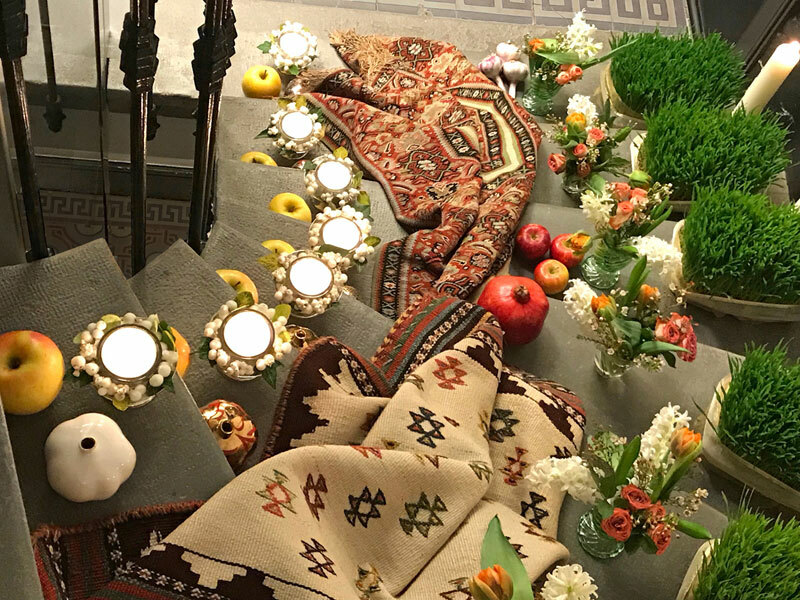 The centre of this inclining sofreh is adorned with seven vases of a mixture of hyacinths, tulips, spray roses and foliage, as well as draped antique kilims, a single oversized crimson pomegranate, miniature apples and a bunch of fresh garlic. This is the overall image of the sofreh entitled Seven Steps. The focus of this image is the upper side of the sofreh, entitled Seven Steps. The focus of this image is the lower side of the sofreh, entitled Seven Steps. The focus of this image is the central part of the sofreh, entitled Seven Steps. This is a striking view from the top of the stairs focusing on the central and narrower section of the sofreh, entitled Seven Steps. This is an engaging view from the top of the stairs of the sofreh, entitled Seven Steps. February, 2019. This small sofreh is inspired by, and designed around a collection of delightful ceramic pomegranates, principally created by the Iranian artist, Keyvan Fehri. A rectangular sabzeh is placed in the centre of the silver tray presenting the ceramic pomegranates. 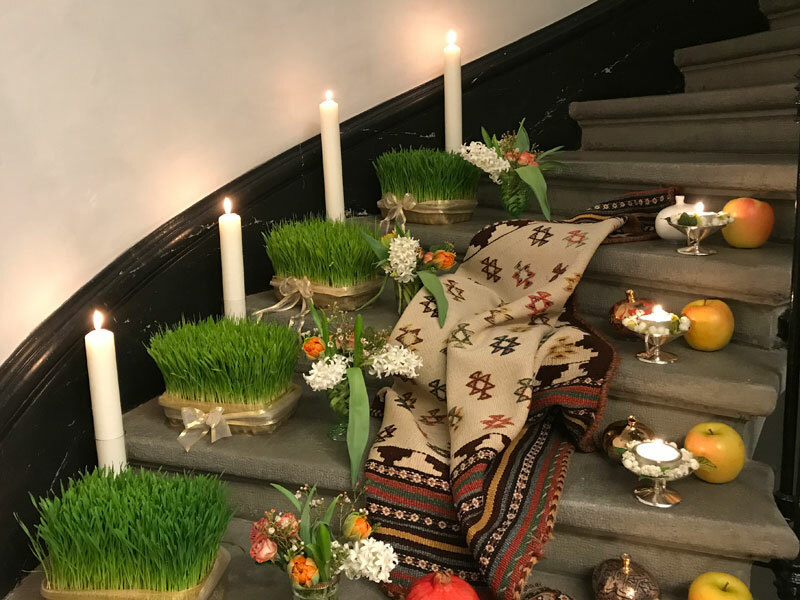 Some other symbolic elements of Nowruz such as apples, hyacinths, tulips and shimmering flames adorn the arrangement. The exquisite embroidered antique textile, known as termeh, enhances this compact sofreh’s beauty. 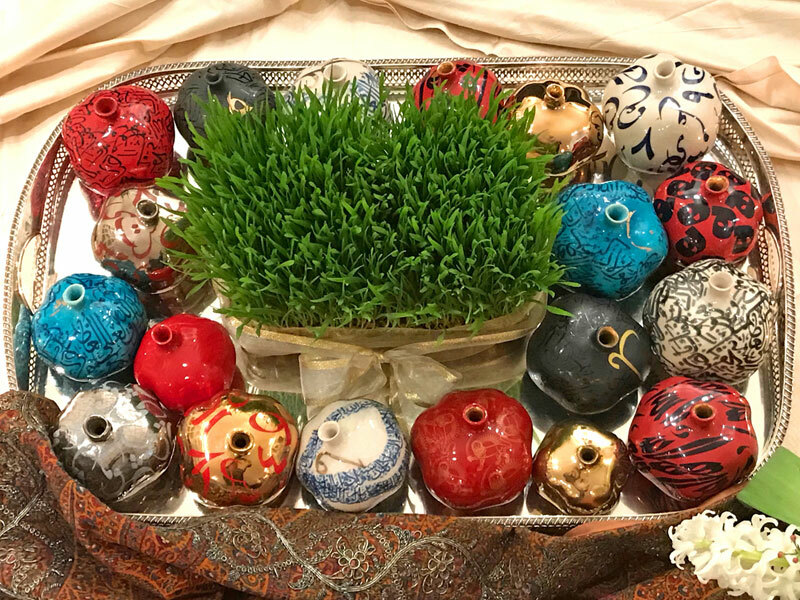 This image focuses on the sabzeh placed in the centre of a collection of delightful ceramic pomegranates, principally created by the Iranian artist, Keyvan Fehri. This is the central section of the compact sofreh, which was inspired by this collection. March, 2019. 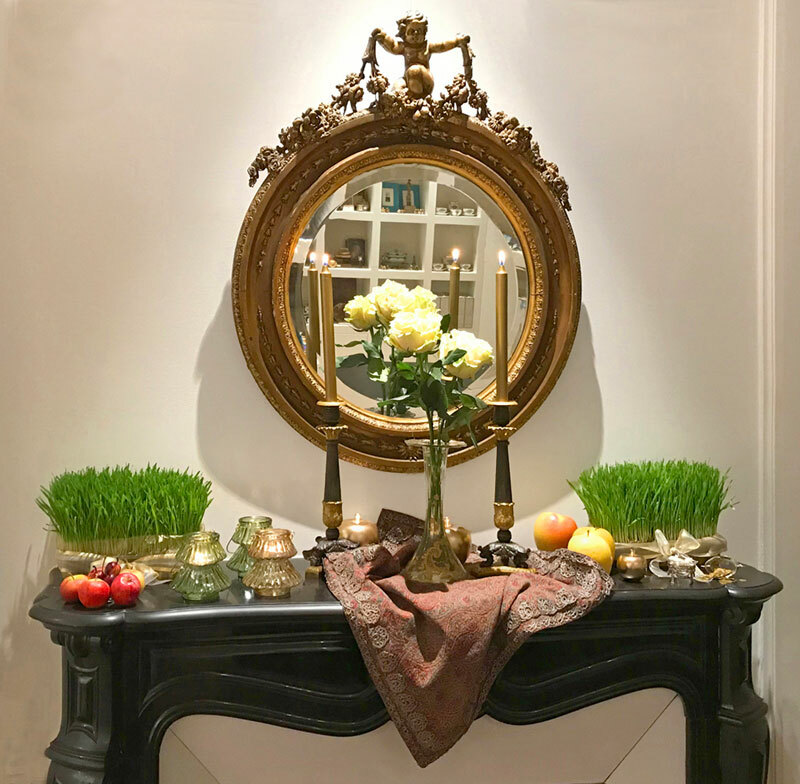 This classic backdrop, with an ornate mirror over a black marble mantelpiece, showcases some of the symbolic elements of Nowruz with blocks of sabzeh adorning each end. The first two images show the overall composition from two different perspectives. This is the frontal view of the overall composition. Plump full-bodied roses are beautifully reflected in the mirror. A lovely piece of termeh with an elaborate trim is draped over the mantelpiece. 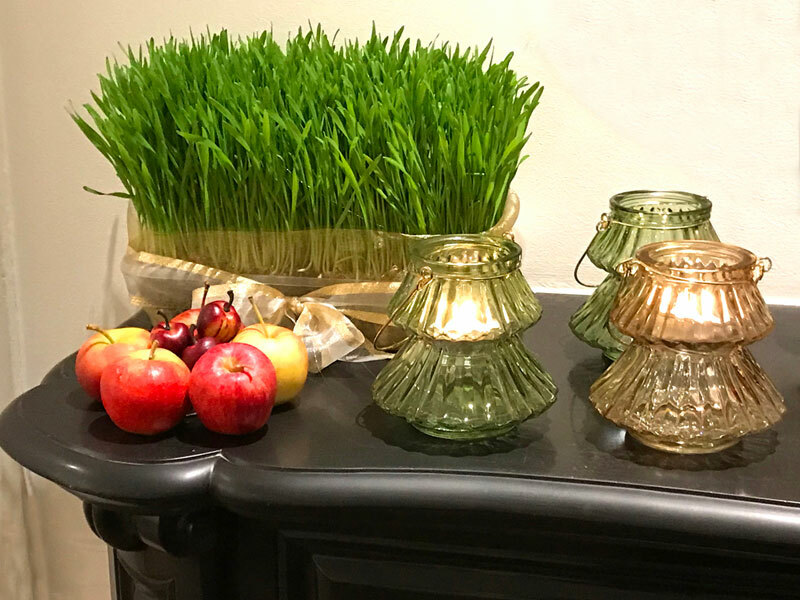 Different shades and sizes of apples, two miniature containers (one containing sugared almonds, the other gilded coins) and lots of glowing flames complement this simple arrangement. This is a slightly angled view of the overall composition. Again, plump full-bodied roses are beautifully reflected in the mirror. A lovely piece of termeh with an elaborate trim is draped over the mantelpiece. 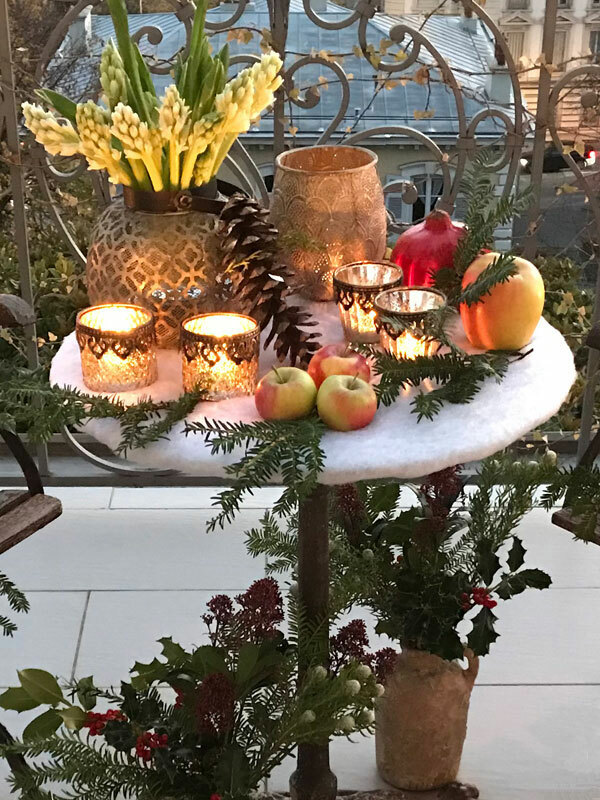 Different shades and sizes of apples, two miniature containers (one containing sugared almonds, the other gilded coins) and lots of glowing flames complement this simple arrangement. 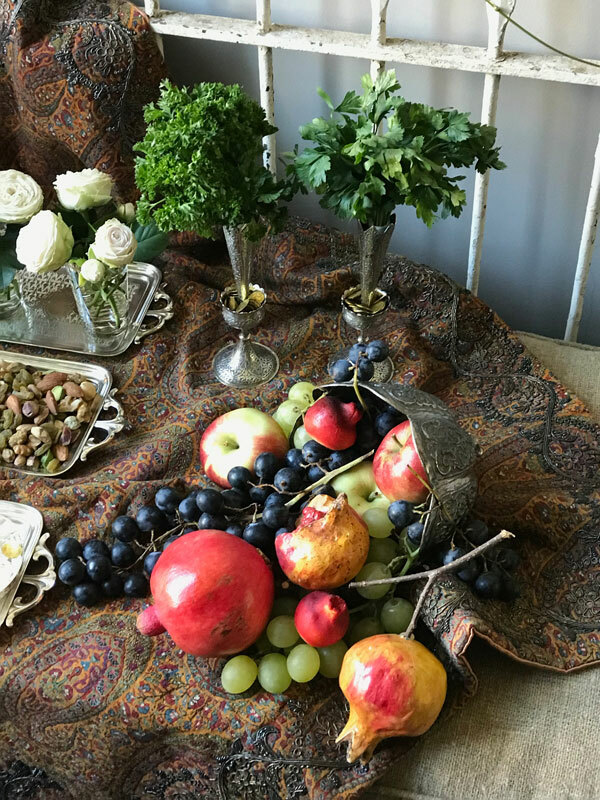 The focus of this image is one end of the arrangement on an antique mantelpiece, incorporating sabzeh, tiny apples and flickering flames. This image focuses on the other end of the arrangement on an antique mantelpiece, incorporating sabzeh, oversized apples, a delicate gold-painted apple sculpture, two miniature containers — one upright, containing sugared almonds, the other on its side containing gilded coins — and a piece of termeh with an elaborate border.